(Nanowerk News) For many, zinc oxide conjures images of bright stripes down lifeguards' noses. But for researchers in Concordia's Faculty of Arts and Science, ZnO is an exciting compound with important optical and electrical properties. For a study recently published in Materials and Design ("Hydrothermal selective growth of low aspect ratio isolated ZnO nanorods"), Concordia physicists Amir Hassanpour and Pablo Bianucci joined chemists Nicoleta Bogdan and John Capobianco to take a closer look at this common material that can be used many different ways. Through their research, they developed a cost-effective method for growing ZnO using an approach that might one day lead to new solar cell designs. "Zinc oxide is the main ingredient in many creams that treat diaper rash and is commonly used as an ingredient in sunscreen," says Bianucci, assistant professor in Concordia's Department of Physics and the study's senior author. "It's also inexpensive, bio-compatible and easy to make." At the microscopic level, ZnO typically exists as a kind of forest of microscopic "trees" called nanorods that are useful for skin cream applications. But devices like gas sensors can also make use of ZnO when the nanorods are arranged in specific patterns. Traditionally, those patterns have been difficult and expensive to produce. But the Concordia research team has developed a new method. "It's easy to grow zinc oxide as a forest of randomly positioned nanorods, where each one has a diameter between 100 and 1000 times smaller than a human hair. But it's not easy to tell the nanorods where they are supposed to grow so that we can get the patterns necessary to create complex items like gas sensors," Bianucci explains. 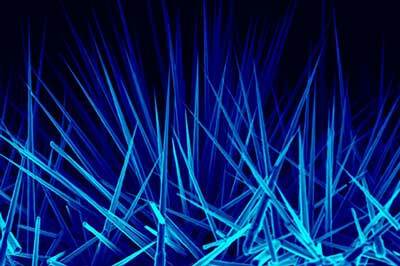 "If we can grow the nanorods how and where we want them, we can create special structures called 'photonic crystals' that trap light. This would lead to the development of efficient ultraviolet lasers, or sensitive optical gas sensors that would change colour when a certain gas is present." The research team has developed a process to make very small nanorods with a diameter of less than 100 nanometres which can be precisely separated, with approximately 500 nanometres between neighbouring rods. "Our study proves that the material quality of these nanorods is the same as those grown in dense forests. What's more, we can reproduce this process on inexpensive materials like glass," says Hassanpour, the study's lead author and a PhD candidate in physics. This shows that nanorods grown in pre-determined positions have the same properties as those that are grown randomly, allowing researchers to fabricate specific patterns for different applications. The process significantly reduces the fabrication cost of some advanced devices, such as small, affordable gas sensors that work more precisely than conventional ones. Hassanpour hopes that this method could one day, with additional development, be used to make lasers that consume very little power, and perhaps even lead to new solar cell designs.